This blog post has the content from the presentation I delivered at ManhattanJS. There are a couple of slides and a repo to go with it. 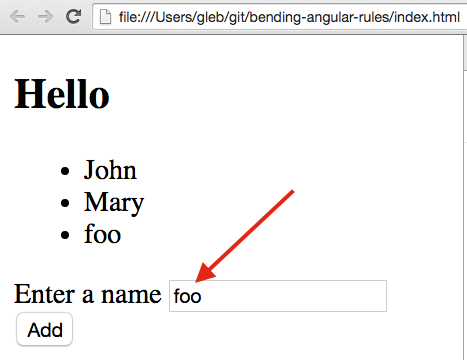 I will show how to reach into a live Angular application and overwrite features on the fly. I will also show how to load the application from the Node environment and how to unit test private code without source modifications. You can try the steps yourself by cloning the repo and stepping through the tagged commits step-1, step-2, etc. We can access the scope of any DOM element (or surrounding it) via element.scope() method. Since the $scope is simply a plain object, to let Angular know we have modified it and would like to see the changes, we need to call scope.$apply() method. We need to write the addName() method, otherwise nothing is happening. Nice! The newName property was created implicitly by the input field bound to the model property newName. 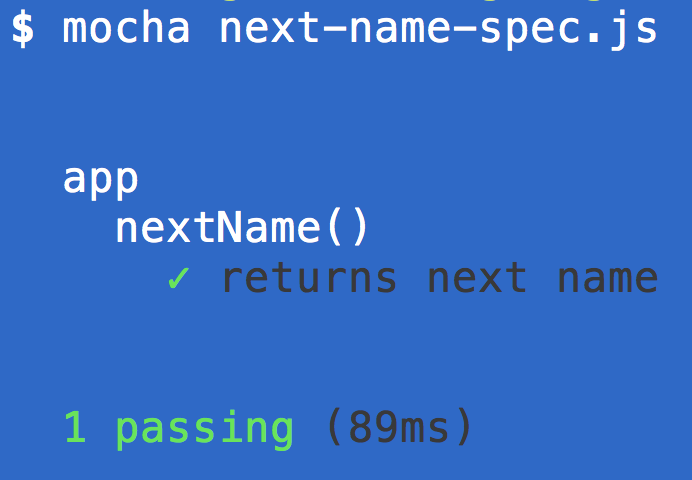 Since we are using built-in click handler ng-click, we did not have to call $scope.$apply() - it is done automatically for us. We notice that the added name is NOT cleared from the input field. 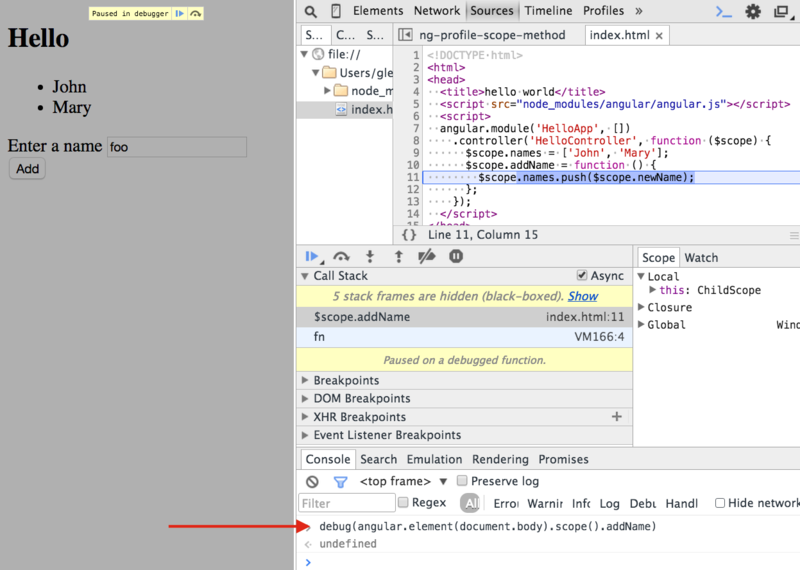 We can even profile long-running methods using Chrome's DevTools by "wrapping" the method in console.profile() and console.profileEnd() commands. See Improving Angular web app performance example for details. This is a complete replacement. What if we wanted to do something else - like partial replacement? Here is a good example. Let us say, $scope.addName grabbed the name not from the input field, but from a server. Duh! We don't have a server to respond. Really useful library based on this principle is ng-wedge, it is a mock response utility for a live application. 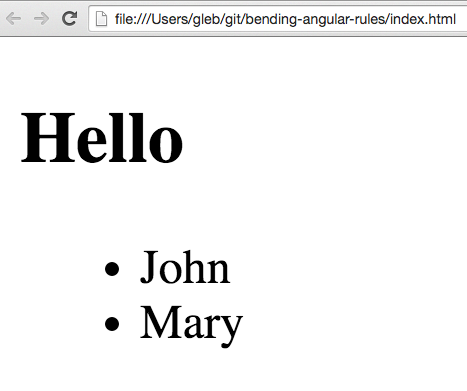 Of course, we loaded Angular framework first in our HTML page, before loading the app.js file. It would be very cool if we could load Angular without window. While this is possible, I prefer a different approach to this problem. We will simulate the full browser environment (window, document) under NodeJS. We can do this using benv module that puts a very simple API on top of jsdom. You can now execute this file load.js from Node to verify that the synthetic environment has been setup and the Angular framework has been loaded. 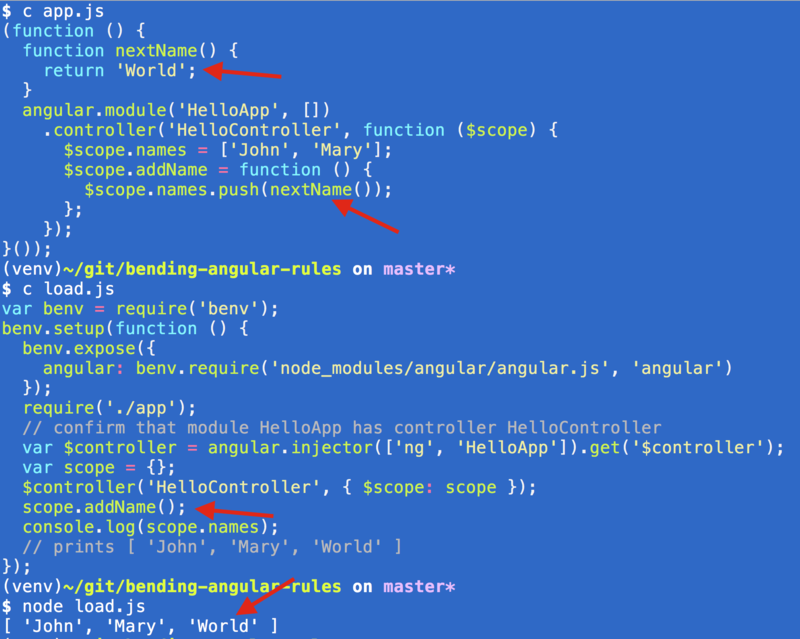 Nice, we are instantiating parts of Angular app directly from the command line using Node without using any browsers. Why did we spend time loading the Angular code under Node? Why is Node's built-in require anything but the ordinary implementation of the CommonJS standard? Turns out it has nifty features we can exploit. It has a preprocessor hook that can run the loaded source through user-supplied callback function before evaluating it. Both of these features were used to implement really-need - a replacement for NodeJS require method. Some of the cool features it can do: rewrite the loaded source, bust module cache, rebuild the compiled exported values, pass arguments to the module and mock __dirname and __filename. The pre hook is especially useful for source rewriting. We could use it to instrument the source code with code coverage statements. Or we could use it to "grab" references to private functions. Why would one need to do this? To enable quick unit testing of private functions, expressions and variables. For example if we had file foo.js that exports nothing, we could run the source through a preprocessor whenever someone required it. Imagine the new name to be added to the list comes from a private function inside the file app.js. ng-dice stands for Angular Dependency Injection and Code Extraction library. We called nextName() directly and confirmed its output. One can argue that unit testing private functions and variables goes against the principles of black box testing. Yes, but it pays to bend the rules a little.